One could fill a thick book with nothing but images of Japanese paintings and woodblock prints of tigers as objects of fascination or hunts. Tigers are featured in Buddhist tales, and in Chinese, Korean, and Japanese folklore, and for these and other reasons they rank among the more significant beasts in Japanese pictoral art. They continue to be prominent as one of the twelve branches or animals that figure in the naming of years in the sexegenary cycle. And as icons of commerce, sports, and entertainment, they are found in names of products, a popular baseball teams, and a disbanded singing group. During the late Tokugawa and early Meiji periods, established drawers and their apprentices cranked out tens of thousands of prints depicting all manner of subjects, including real and imaginary animals. The prints were produced as commodities, but publishers vied with one another to employ popular drawers, carvers, and printers who were skilled in conventional woodblock technology and but also capable of innovating new graphic methods, pigments, and other techniques that would attract attention in printshops. Drawing a tiger that was appropriately striking -- at once beautiful and terrifying -- was a challenge that virtually all aspiring drawers and carvers had to master as part of their training. Apprentices strived to emulate their teachers, and successful drawers and carvers could probably be ranked according to their mastery of the art of getting the proportions and details of a tiger right. Kuniyoshi (國芳 > 国芳 1791-1861), signing as Ichiyūsai Kuniyoshi (一勇齋國芳 > 一勇斎国芳), drew a series of prints called "Bird and beast pictures" (禽獣圖會 > 禽獣図会 Kinjō zue). Each featured one or a pair of animals. They seem to have produced in the early Tenpo years. One shows a horse (馬), another a Chinese style lion (獅子), another a large mythical bird above a lobster (大鵬 海老), and the one shown here of a dragon and a tiger (龍虎). Antique Arts Morimiya (森宮古美術 / 古美術もりみや), in Aichi prefecture, was offering the print for 200,000 yen, which is out of my league. The dealer dated it circa Tenpo 8, or roughly 1837. It bears, to my eye, a seal of the "kiwamein" (極印) type, which was used between 1791 and 1842. Kuniyoshi (国芳 1791-1861) drew a triptych called "Watōnai toragari no zu" (和藤内虎狩之図), which depicts the warrior Watōnai driving back and subjugating a tiger during a tiger hunt . . . Some people also take this to be a representation of Katō Kiyomasa's feat in Chōsen. And perhaps it also alludes to Kato's hunt, but there is more to the picture than this. Katō (1562-1611) preceded Chen Ch'eng-kung (1624-1662), the character on which Chikamatsu Monzaemon (1653-1725) based the character of Watōnai in a 1715 bunraku play known in English as "The Battles of Coxinga". Not that any of this would have mattered to Kuniyoshi, who like most drawers of pictures intended for books and woodblock prints were mainly interested in flaunting their graphic skills and imaginations. Mostly they followed conventions, by copying elements of known works in their own libraries or those of their teachers. And the rest they made up. Kuniyoshi, a master at both, created new elements that became conventions of peers and successors with lessor imaginations. Watōnai was the hero of Chikamatsu Monzaemon's puppet play "Kokusen'ya kassen" (国性爺合戦) -- or "The Battles Coxinga" as Donald Keene titled his translation. Born in Hirado to the Ming loyalist Tei Shiryū (鄭芝龍), who had taken refuge there, and a Japanese woman, Watōnai sails to China with his father and mother to help his father overthrow the Manchu conquerers and restore the Ming dynasty to power. Watōnai's name implies that he is "in" or "of" (内 nai) both "Japan" (和 Wa) and "China" (藤 > 唐 Tō). 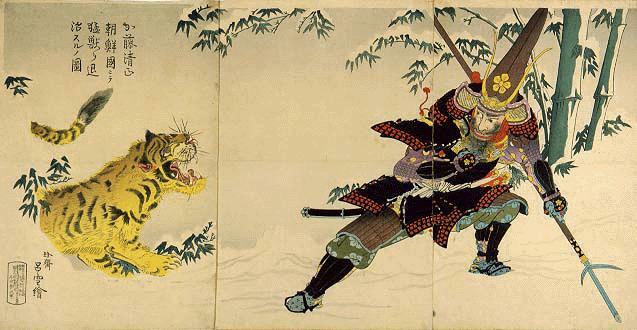 In China, while passing through a deep bamboo grove called Chisato ga Take (千里ヶ竹), Watōnai encounters a fierce tiger, which he subjugates, and tiger helps him defeat some enemy forces. Watōnai is modeled on Chen Ch'eng-kung (鄭成功 Zheng Chenggong, J. Tei Seikō, 1624-1662), aka as Koxinga (國姓爺 Kuo-hsing-yeh, Guoxingye; 国姓爺 Kokusen'ya), an historical figure who was born in Japan to a Japanese mother and Cheng Chih-lung (鄭芝龍 Zheng Zhilong, J. Tei Shiryū). Koxinga, in actual history, became a powerful leader of forces along the coast of China, where he attempted to defend the last claimants to the Ming dynasty when it was overthrown by the Manchus who created the Ching (Qing) dynasty. Koxinga, leaving his son to command remants of forces on the continent, defeated Dutch forces then in control of Taiwan, which he intended to use as a base of operations. After his death, his son was forced to retreat to Taiwan, from which he continued to harrass Ching forces. Eventually, though, he accepted defeat and made amends with the new dynasty, which began to exercise more influence over Taiwan but was never able to fully control the island. The bunraku drama later inspired kabuki versions. Of greater interest here, though, is the drawing. 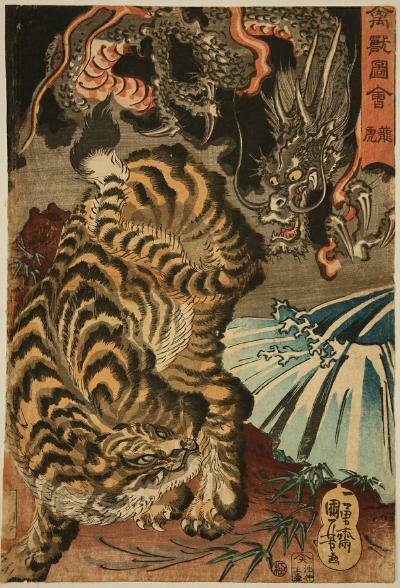 The tiger is shown coming down the mountain, as in Kuniyoshi's bird and beast print of the dragon and tiger. This is, in fact, the most common posture of the tiger on vertical paintings and prints. Note also the body of water, apparently here a sea -- whereas the dragon and tiger print had a waterfall. There are a number of copies of this print in museums in Japan, and some are shown in fairly high resolution scans, but none clear enough for me to read the seal with any certainly. The Edo-Tokyo Museum dates the print circa Tenpō 14 to Kōka 4 (roughly 1843-1847). The seal is of the nanushiin (名主印) type, representing the name of the approving authority, and this appears to be the basis of the dates, since the seals of two such authorities appeared on prints from Kōka 4 to Kaei 5 (about 1847-1852). During the late Tokugawa and early Meiji periods, established drawers and their apprentices cranked out thousands of prints depicting the legendary feats of heroic figures. The prints flaunted conventional and novel techniques of pictoral representation as forms of graphic entertainment. Not a few prints as objects of fable and lore, but also as animals The TKU Korea print collection includes no less than seven "tiger hunt" prints, four of which are pre-Meiji "Satō Masakiyo" or "Masakiyo" prints. The public website of Tokyo Keizai University Library's Sakurai Bunko collection of Korea-related woodblock prints (see particulars under Sources below) includes seven "tiger hunt" prints, four from the last two decades of the Tokugawa period, and three from the the Meiji period. The hunter on the pre-Meiji prints is Satō Masakiyo or just Masakiyo, while the hunter on the Meiji preints is Kaō Kiyomasa. In the early 1840s, during the so-called Tenpō Reforms, some officials attempted to censor the sort of lampooning that had become popular among writers and drawers. The reformers soon found themselves out of favor, and themsleves became the object of lampooning. But from this period, conscious of the sensititives of Tokugawa authorities, writers and drawers resorted more to the familiar device of using fictitious names for characters based on historical figures -- both to avoid criticism of misreprestation, and to give them more opportunity for imaginary representation. Savvier consumers of stories, dramas, and color woodblock prints would, of course, recognize that "Satō Masakiyo" was "Katō Kiyomasa". Katō Kiyomasa (加藤清正 1562-1611) was one of the general's who led Hideyoshi's invasion of Chōsen (K. Chosŏ) between 1592 and 1598. Kiyomasa, whose childhood name was Toranosuke (虎之助), is supposed to have slayed a tiger in the course of a campaign on the peninsula. The tale of his feat is regarded as folklore, but who knows. 1. The left paw of the tiger is not "encroaching on Japanese territory". Even if the waterfall between the warriors on the right and the tiger on the left is meant to symbolize the Japan Sea, the water cascades cleanly between the two realms. Several of of the "tiger hunt" prints show waterfalls as part of a mountainous landscape. The landscape of this print shows snow on branches of trees and outcroppings of rocks. 2. The large figure in the center who is wielding the spear is obviously the Satō Masakiyo aka Katō Kiyomasa himself. He is the hunter, and the spear he has "aimed at the animals throat" is poised to stab the animal -- not hold it at bay. The object of a "tiger hunt" is, after all, to slay tigers. 3. The print is titled "Satō Masakiyo toragari no zu" (佐藤正清虎狩之図) or "Drawing of Satō Masakiyo's tiger hunt". It was drawn by Kunitsuna (国綱) and published by Taihei (大平). The approval seal appears to represent the 7th month of the year of the monkey (申 kō, i.e., kōshin 庚申) on the lunar calendar, which straddled August and September of 1860 on the Gregorian calendar. 1. The print Caprio attributes to "Katada Nagajirō" is titled "Katō Kiyomasa Chōsen-koku ni te mōjū o taiji suru no zu" (加藤清正朝鮮国ニテ猛獣ヲ退治スルノ図) meaning "Drawing of Katō Kiyomasa slaying [eliminating, suppressing] a fierce beast in the country of Chosen". Information on the print shows that it was drawn by Chinsai Rosetsu (珍齋呂雪) and published by Katada Chōjirō (片田長次郎). I have not been able to see a clearer copy of the print to verify the publication date, but it may have been 1904. Katada, a carver-turned-publisher, was the third in a succession of carvers who used "Chō" in their signatures, such as Hori Chō (彫長). As a publisher, he produced numerous prints during the last two decades of the Meiji period, when woodblock prints were losing ground to lithography and photography, and drawing and designing prints was a dying trade. Katada put out at least two other Russo-Japanese prints signed by Rosetsu (呂雪) -- one depicting a collision of forces in the vicinity Heijō (平城 K. P'yŏsŏng) near Heijō (平壌 P'yŏngyang), another a naval battle at the mouth of Port Arthur (旅順 Ryojun). I have made extensive use of the following two sources. A substantial collection of Korea-related woodblock prints can be viewed as low resolution images at Tokyo Keizai University Library / Digital Archive (東京経済大学図書館・デジタルアーカイブ). The images are not of especially high quality but are suitable for general study. The collection is formally known as Sakurai Yoshiyuki Bunko (桜井義之文庫) or just Sakurai Bunko (桜井文庫) after the man who donated it to the university. The title of the web presentation of the Korea prints is "Tokyo Keizai University Library Collection / Images of Korea in Ukiyoe Prints Reflecting Meiji Era Stereotypes of Korea" in English. The Japanese title is simply "Tokyo Keizai Daigaku Toshokan / Chōsen nishikie korekushon" (東京経済大学図書館 / 朝鮮錦絵コレクション) or "Tokyo Keizai University / Chōsen nishikie collection". Sakurai Yoshiyuki (桜井義之 1904-1989) is best known as a bibliographer. He spent about seventeen years of his life in Keijō in Chōsen. From 1928 to 1941 he worked as an archivist and researcher at Keijō Imperial University. In 1941 he took a position with the documents department of the Government-General of Chosen and became involved in the editing of GGC's organ magazine Chōsen (朝鮮). After World War II, through introductions from people he had known at Keijō Imperial University, he held posts at a number of univeristies in Tokyo as an archivist and a professor of library science and bibligraphy. Sakurai made part of his personal collection of prints and other materials available to TKU for exhibition in 1974 and the rest in 1984. By 2003 the Korea prints had been filmed to facilitate the distribution of digital images. The website was created in 2004, and the archival project and a link to the website was publicized in Asahi Shinbun on 17 November that year. TKU Library's web database lists a microfilm, of 264 sheets, called "Sakurai Bunko Chōsen Nishikie Shashin Firumu" (桜井文庫朝鮮錦絵写真フイルム) or "Sakurai library Chosen nishikie photographs film". The following book by Kang Duksang is the best single volume collection of nishikie related to Korea and China from the late Tokugawa and Meiji periods. The book begins with citation of remarks by Sakarai Yoshiyuki, which amount to Kang's tribute to the bibliographer and collector. Though this book is the smaller B5 sizeimages in this book, though not I have reviewed this book as Kang 2007 under Politics in the Topics section of the Bibliography of this website.